Movie Review: “Sicario” is an adult, virile, expertly crafted thriller. Just as we expected since it was directed by the acclaimed Quebecois filmmaker, Denis Villeneuve, who already had stun us with the rigorous “Polytechnique”, the thrilling “Incendies”, and the enigmatic “Enemy”. His last, “Prisoners”, despite the great performances of Hugh Jackman and Jake Gylenhaal, was the weakest link of a vibrant career, a sort of a breach that “Sicario”, which intelligently addresses an exceptional operation carried out by the CIA to hunt the leader of a drug cartel that infests the troublesome US-Mexican border, comes now to restore. The TV series actor, Taylor Sheridan, has an auspicious debut on screenwriting, devising a story that never felt unreal, strained, or pretentious. Every move is made seamlessly, and even the darkest and most violent moments are compelling and utterly absorbing. Emily Blunt is Kate Macer, an acute FBI agent who plays an important tactical role in a SWAT team that recently has discovered dozens of mutilated bodies concealed in a secluded house in Arizona. Almost without any explanation, she’s assigned to help with an unclear CIA mission said to occur around the El Paso area. Kate will operate under the orders of Matt (Josh Brolin), a flippant consultant for the Department of Defense, who doesn’t stop to surprise us along the way. He’s the kind of guy who goes to important meetings wearing flip-flops, adopts a disconcerting posture when questioned, and embraces a natural carefree attitude. The team also relies on the ambiguous Alejandro (Benicio Del Toro), a drug-cartel connoisseur with a shadowy past. His determination may be similar to Kate’s, but his true motivations, integrity, and modus operandi are totally distinct. 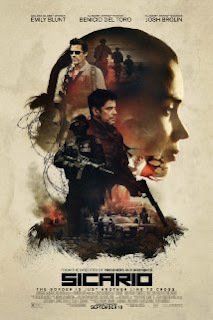 “Sicario” carries high levels of tension, a considerable number of violent action scenes, and a psychological side that works in the plenitude of its possibilities. It doesn’t cross the borders of perfection (a redundant subplot involving a Mexican police officer feels time-consuming), however, it’s equipped with a down-to-earth photography, a disquieting musical score, and gutsy action scenarios. All the performances were phenomenal, but Del Toro is the one who steals great part of the show.